Didier Chaput is 35years old, a happy smile on the face, and a growing passion for more than 20years, never decreased and teach at FERRANDI Paris for more than 2 years now. Originally from Roanne, it is while being an apprentice that Didier, student willing to learn and motivated, discovered this work that has always attracted him through the years. Then, followed 6 years in a very traditional bakery to practice, use flour and doughs. Keen to meet new people and see something else, he has gone to several bigger companies, including 3 years in luxury hotel in Carcassonne. He, then, knew that he was also gifted for being a sales man and became a trainer in Paris. 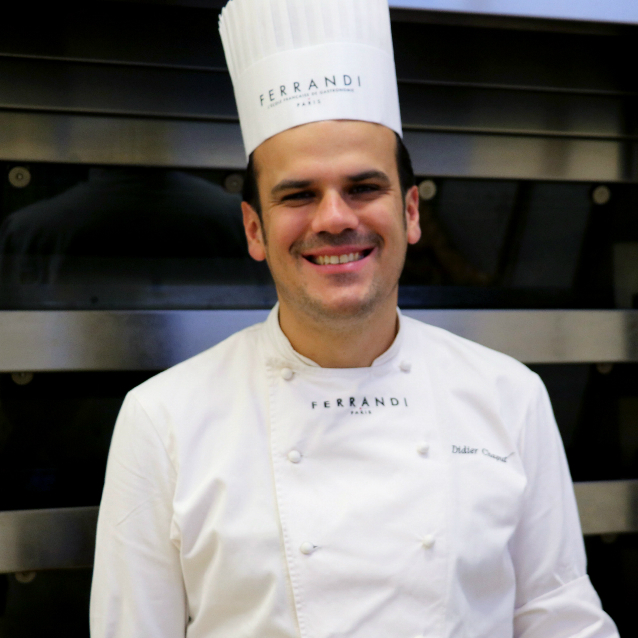 With his impressive background and skillfulness, Didier decided to settle down at FERRANDI Paris, to make a dream come true, always in the back of his mind: TEACH. Didier explains that he has a need for sharing and meeting people, to pass on knowledge, techniques and see motivated people like him in this culinary field. Here he is: teaching bread baking, he describes his task: make something that is common use, daily, attractive that will catch the attention and healthy for your body. It is how Didier makes his everyday work in this prestigious school that allows being very close to the students, to see how they evolve thanks to small groups. Plus, Didier speaks English; he can teach an international audience and get to meet new cultures. Because teaching, allows the blossoming and development of beautiful stories, and beyond sharing technique, it reveals true love for this work. Didier is particularly sensitive by the enthusiasm, motivation and passion shown by the students. Because they are getting ready for a very demanding job that you much love. As an instructor, he knows how to adapt to the different learning paths of his students take: “ Good or not, we will succeed and get there” he repeats at the beginning of each class. To candidate wishing to join FERRANDI Paris, Didier advice you, to find your own personal path in order to always remain curious and open, like him! Today, Didier keeps on improving himself: that is how he became Vice-champion of France In bakery at the Sirha 2017. That is a proof of perseverance. Bread of course! Unlike viennoiseries, we work on a dough very much more alive, with which we need to communicate and have feelings. My favorite bread would be sourdough bread whose recipe is quite old and the process is longer than the other. Everything is a matter of feelings. 2. If you would be a dish or a dessert ? Who can say no to a pain au chocolat ? 3. A guilty pleasure ? 4. A word to describe your work ?